*UPDATE* Looks like its been done before. The article posted bellow was by Fox News. However the Empire State Building fb page and other resources confirm it will be lit up this year as well inshAllah. MV: In appreciation of Eid-Ul-Fitr this year, the empire state building will be lit up ‘green’ for Eid! This is just plain awesome! I grew up in New York and this is exactly why NY is the best state ever! 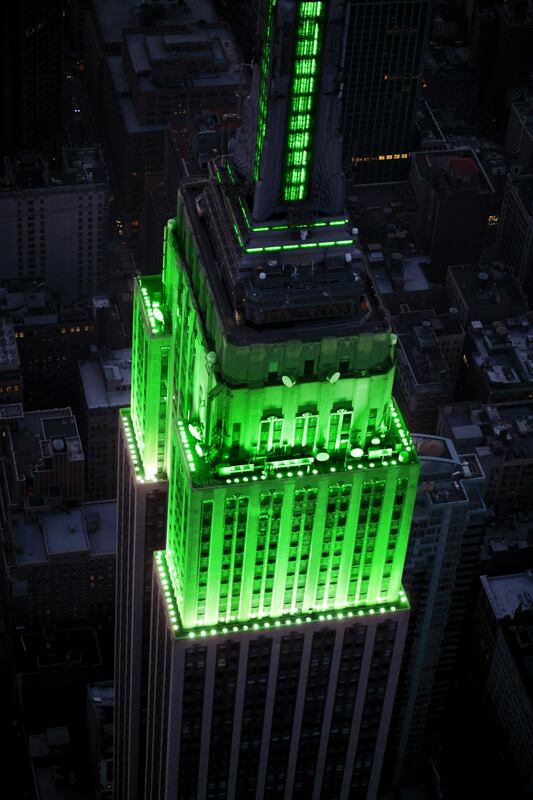 “We will shine our tower lights in green this weekend to honor the holiday Eid-al-Fitr.” -Empire State Building Fb Page. The Empire State Building is aglow in green this weekend to honor the Muslim holiday that marks the end of Ramadan. The 102-story building routinely lights up its famous spire to honor everything from traditional holidays to sporting events to notable charities to “the myriad ethnic groups living in the New York City area,” according to the building’s website . But Thursday night marked the first time the all-green lighting was used to mark the kickoff of Eid-al-Fitr, a three-day celebration for Muslims around the world. The all-green lighting was used earlier in the week to promote the city’s Parks Department. Not many religious holidays make the cut. Green and red are used every year to mark the Christmas holiday season, and blue and white — the colors of the Israeli flag — are used for the Jewish holiday of Hanukkah. And the building doesn’t fire up its thousand-watt bulbs for just anyone. The “extraordinary number of requests” cannot all be accommodated, according to a building statement. Lighting up the spire for commercial products and corporate events is out, as is the commemoration of personal events like birthdays or anniversaries. The Empire State Building’s tower was first lit up in colors in July, 1976, when red, white and blue were used in celebration of the American Bicentennial. A new lighting system that allows a wider range of colors was inaugurated the following year, when blue and white lights flashed to announce the New York Yankees had won the World Series. I would like to share with you that, as per Makkah Calendar website, Eid Al Adha 2012 / 1433 should be celebrated on Friday, 26th October 2012 all over the world. Masha Allah! Following are the links for Makkah Calendar pages. Next Next post: Ramadan Reflection: How Was Your Ramadan This Year?